Import Car Repair Shop Gets a Tune-Up. We’ve known Dale at Euro Classics for years and finally convinced him of a much needed site overhaul. 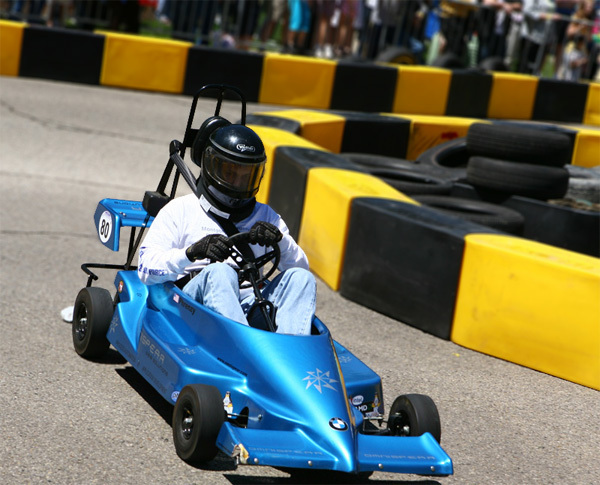 His shop was well known in the enthusiast community for their quality and craftsmanship. Our mission was to help him expand his reach to all import car owners regardless if it was a Volkswagen or a Ferrari. The solution for Euro Classics was based off a Laravel PHP framework. Our custom blogging platform allows Euro Classics to easily maintain their shop news without the need to learn a full CMS. For our web development team, coding the pages directly in an IDE is considerably faster than the drag-n-drop or WYSIWYG interfaces associated with most platforms. This allowed our team to turn the site around much faster and with greater control over the appearance. 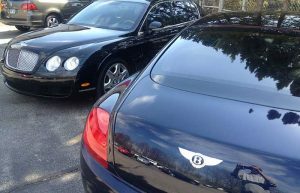 We look forward to seeing the site perform well as there is a fair amount of competition among Foreign car repair shops in the Dayton area. The radial blur filter allows us to enhance an image by adding a zoom effect. This is a powerful effect that will require us to mask out parts of the image to preserve our subject. In this example we are focusing on the vintage BMW 2002tii sports car. 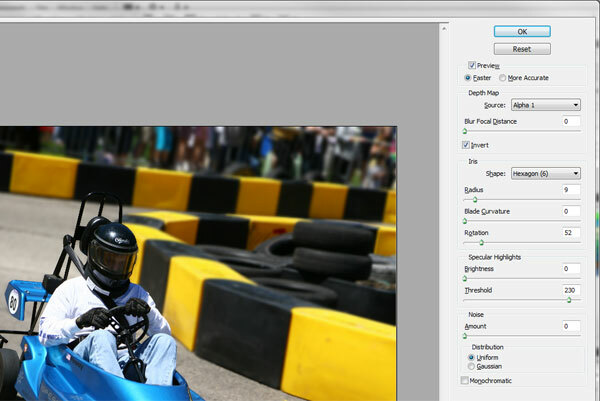 Take note of the flat focus of original image, although slightly dramatic we will use radial blur to add some excitement. 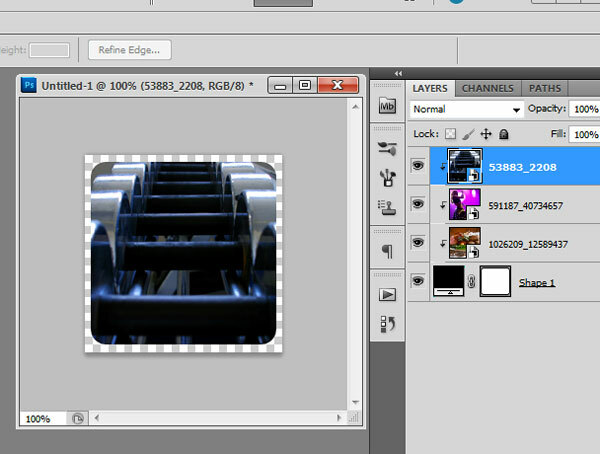 In order to create this result we start by duplicating our background image layer twice for a total of three layers. 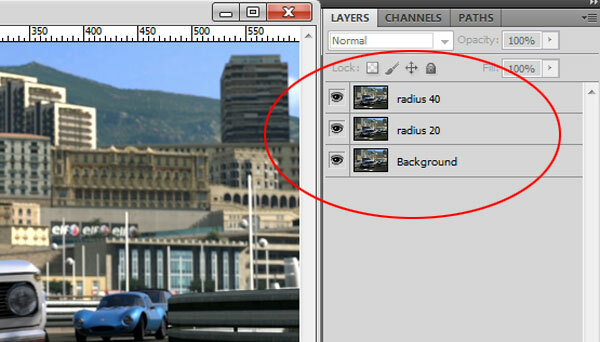 Select your background then go to: Layers -> Duplicate Layer… Let’s rename the top two layers radius 20 and radius 40. 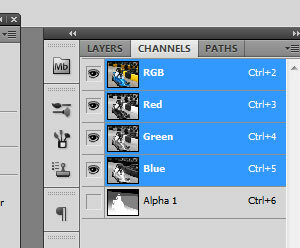 Our next step is to add the filter effect to each of the duplicated layers. We start by selecting the radius 20 layer and adding: Filter -> Blur -> Radial Blur… This will bring up the options for the effect. 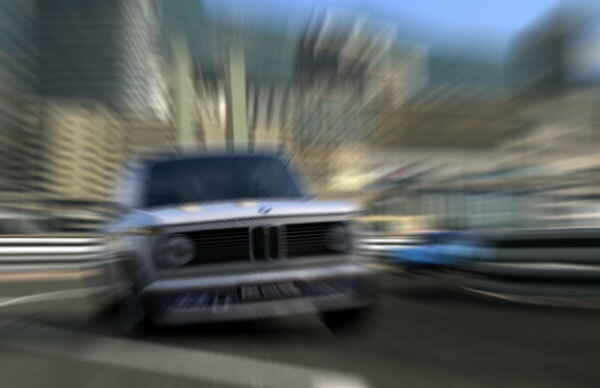 We set the effect for this as follows: Amount = 20, Blur Method = Zoom, Quality = Best. We also drag the Blur Center to the approximate location of our subject, the BMW sports car. There is no built-in preview for this effect so you will need to make your best guess. It may take a few attempts to get your focus point set for the Blur Center. Our next step will be to replicate this effect on the radius 40 layer. Add the filter effect and only change the amount from 20 to 40. 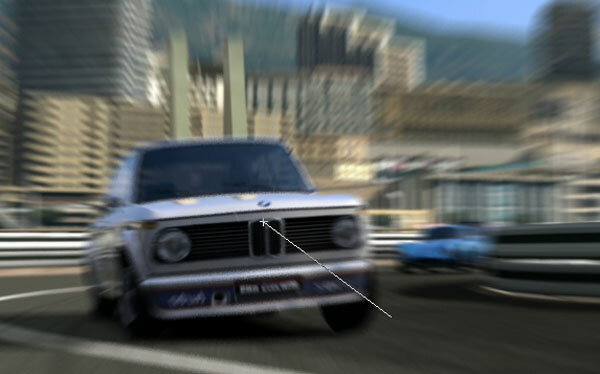 Do not change anything else in the settings for the Radial Blur except for the amount. It should result in a layer with a greater blur effect. 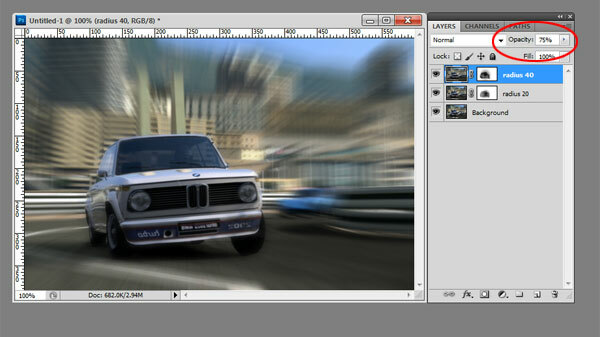 Our next steps will involve the use of layer masking to reveal our sports car amongst the blur effects. Select each of the radius layers and add a layer mask to each one. There is a handy shortcut button for this located in the footer of the layers window that will add the mask to the selected layer. Repeat this process for both of the radius layers, we will reveal the focused object from each layer. 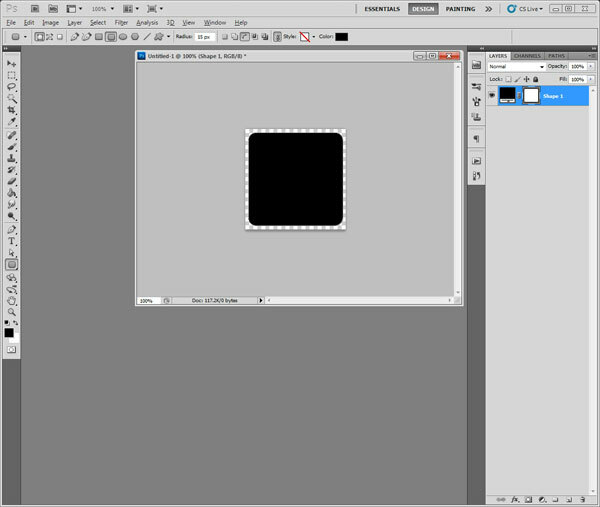 Start by hiding the radius 40 layer by clicking the small eye icon in the layers window. 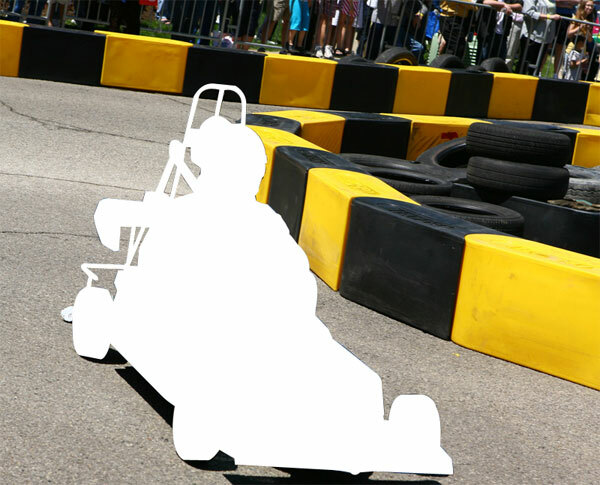 Then select the layer mask (white rectangular block) on the radius 20 layer. 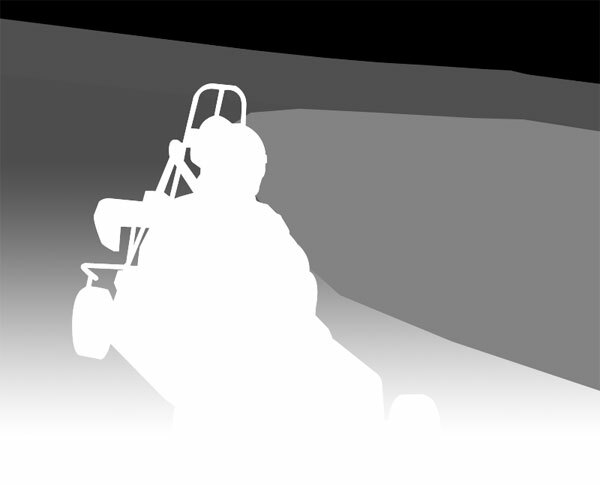 With the layer mask selected, choose your gradient tool and make sure the color palette is set to pure black and white. Also make sure your gradient is set to: Radial Gradient. 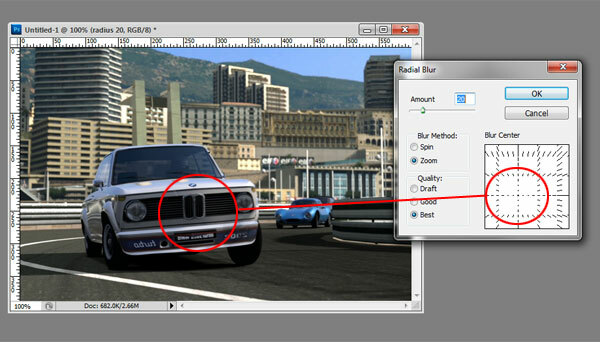 Select the center of your object and drag the radius out to the edge of your intended focus area. This will result in a center focused image with blurry edges. Our next step is to manually brush-in more of the focus object. 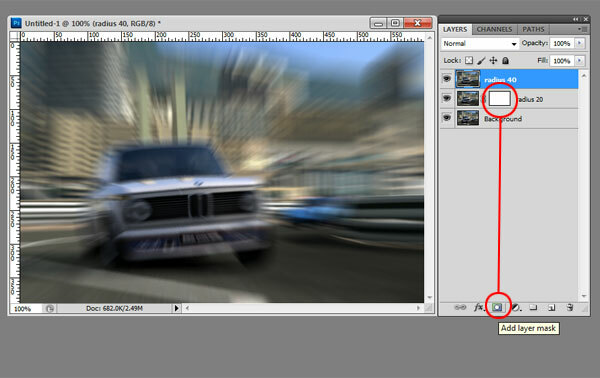 We achieve this by selecting the paintbrush tool, giving it a manageable brush size and setting the opacity lower. For this image, we set it to 50%. 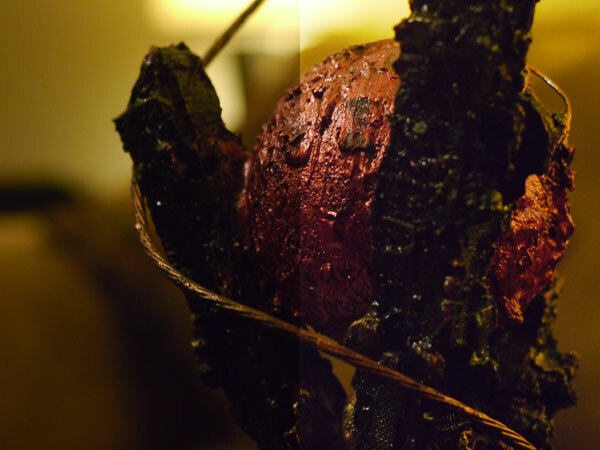 If the opacity is set too high the resulting mask will have harsh edges and produce an unnatural result. Brush around your object until the points of focus start to show through. Repeat this same masking process for the radius 40 layer. This will result in having your focus object completely visible and everything else blurred. The final step is to adjust the opacity of the radius 40 and radius 20 layers. The amount set is completely subjective. You will need to find the balance that works for you. We set the opacity to 75% for both layers in this example. Once you are satisfied, save your image into your desired format. Don’t forget to have some fun with it! 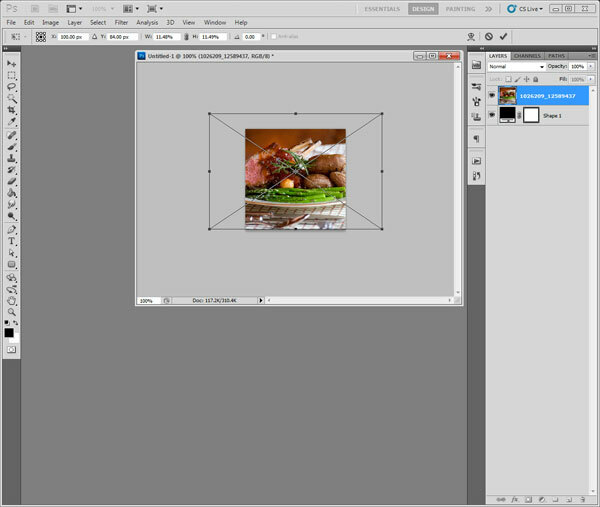 The curves tool is very powerful for image manipulation. We use curves to precisely adjust the tonal characteristics of an image. In this tutorial we will explore the curves tool in its simplest form to adjust the contrast of an image. The original photograph was taken in a room with natural lighting and it looks acceptable. However, we can add an adjustment layer to it to give the photograph a precise contrast making it warm and rich in color. 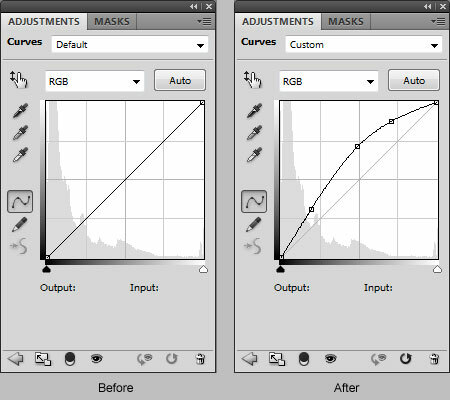 The curves tool is very precise and a small adjustment goes a long way! Here is a side-by-side view of the photograph before and after the adjustment. So how did we get to the finished product? It’s really quite simple. We start by adding an adjustment layer to our original photograph. From the top menu: Layer -> New Adjustment Layer -> Curves… There is also a shortcut in the layers window for this as well. 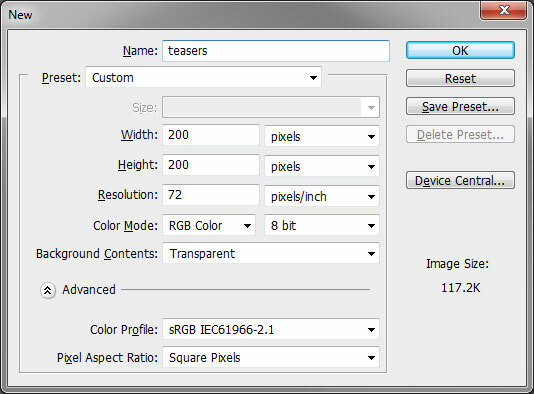 We could also change the image directly without the adjustment layer however this allows us to see our effects without corrupting the original photograph. 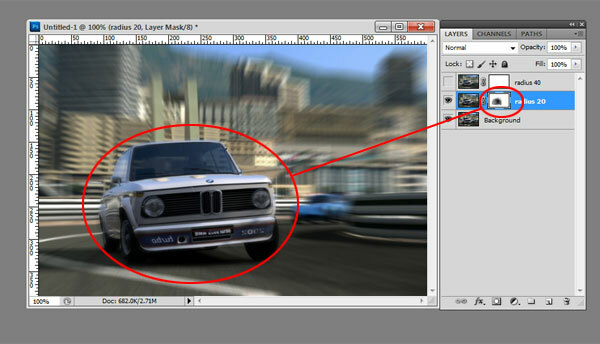 Once the new adjustment layer is inserted we manipulate the tone of the image by adding points to the “curve”. The curves window displays a histogram representing the distribution of light throughout the image. The left side is the dark the right side represents the lightness. Take note of the black to white gradient at the bottom of the chart. Points may be added by simply grabbing the line at any point and moving it around. Once you have created a single adjustment point you may add others to gain the exact levels you require. Points may also be deleted as necessary just select the point and press your delete key. This is a small sample of what can be achieved with the curves tool. Add additional adjustment layers and play with it, you may find combinations of different effects that make your image a work of art. Custom shapes are vector-based objects which add an endless array of possibilities to your designs. Photoshop by default has a basic set of shapes which includes arrows, star-bursts, speech bubbles and other random objects. These items are handy but on occasion we need something completely unique. In this tutorial we will explore the creation of our own custom shapes. 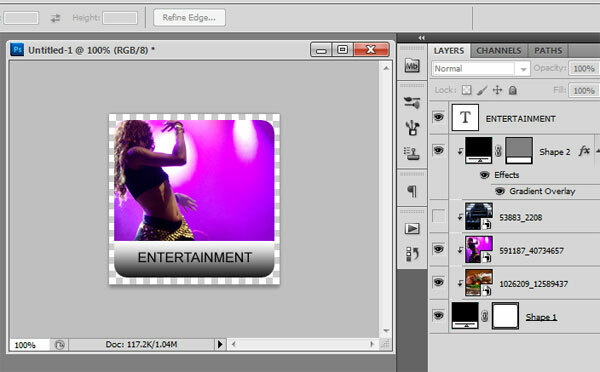 For this example we are going to take a rather small raster icon and convert it to a vector shape. We start by opening up our image and selecting the pen tool. The pen tool has a few options once selected. Make sure the “paths” option is selected otherwise the shape you create will automatically “fill” with the selected foreground color making the process more difficult. Create the initial object outline using the pen. You should make this outline as detailed as possible since the shape you are creating will be a vector object which may be scaled to a very large size showing any inconsistencies. Our first path outline illustrates how a basic shape may be created. Although for this particular item it needs more detail. 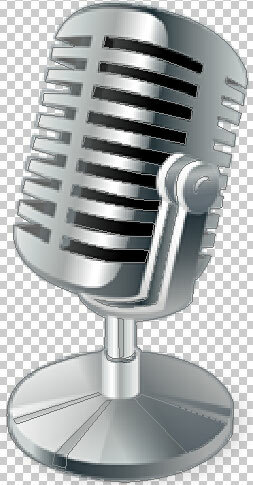 Take note of how it resembles the original but really lacks the detail which defines the object as a microphone. We now revisit the object and outline additional parts of the microphone which will add the detail needed to make our shape resemble the original more closely. You may add as much detail as needed to accomplish your specific needs. 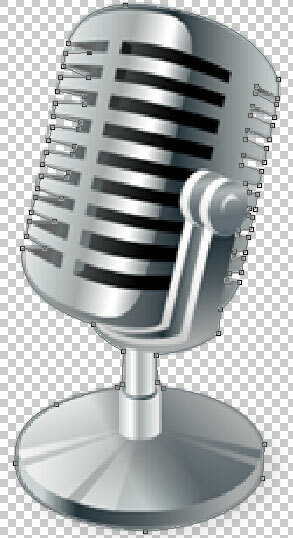 For this microphone, we decided to outline all of the “ribs” and parts of the stand including some of the reflections. The resulting custom shape is considerably more complex which makes a better representation of the original item. Name your new shape and it will be added to your shape library for use in any project you may need it. Select the custom shape tool from the hidden menu under the rectangle and have some fun with it! 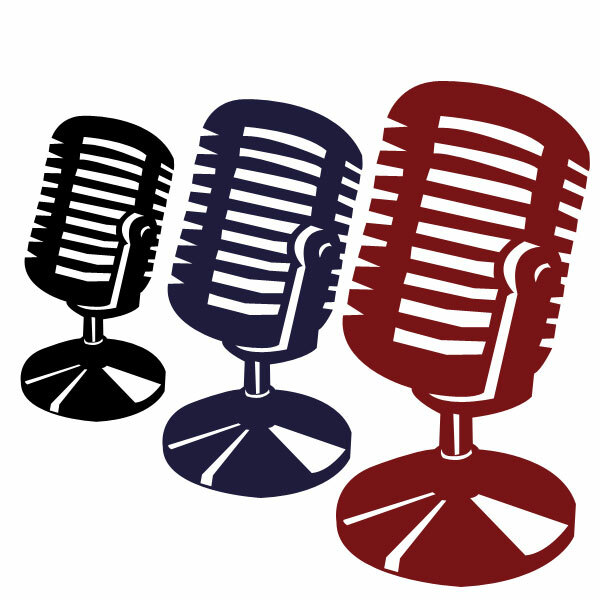 Here is an example of our new microphone shape re-sized and colorized.